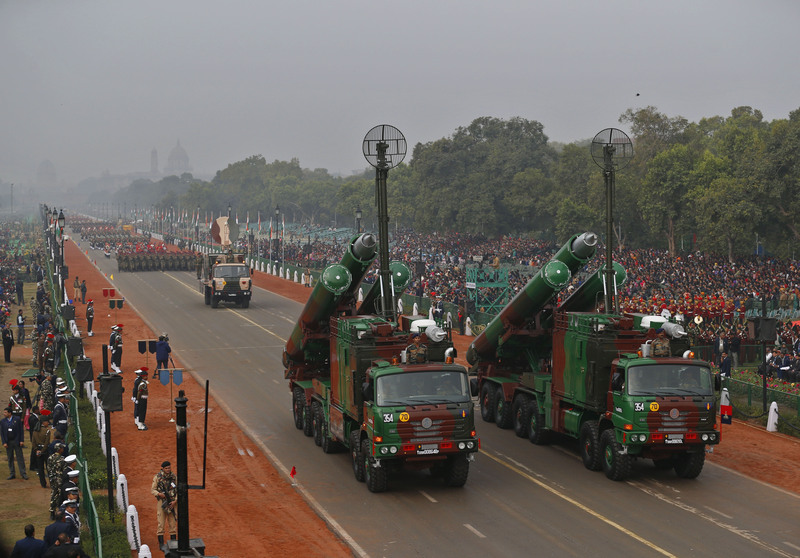 Brahmos supersonic missiles, jointly developed by India and Russia, are displayed during full dress rehearsals for the Republic Day parade in New Delhi, India, Thursday, Jan. 23, 2014. The supersonic "BrahMos" cruise missile, a joint collaboration between Russia and India, is, in fact, the first “Make in India” project which began long before the advent of the slogan. Alexander Leonov, CEO of a leading Russian space and rocketry company, “MIC “Mashinostroyenia", involved with the Russian side of the "BrahMos" project, tells RIR about the importance of cooperation with India and future plans for development of missiles. "I do not know of any other projects where, for so many years, cooperation was continued in such a good atmosphere; both from a purely technical point of view, and as human beings. The Russian and Indian parties have a full understanding; I mean scientists, engineers, and customers. For the development of the “MIC “Mashinostroyenia" project was of great importance. And today, after so many years, it is very significant for us, including the scope of the work,” Leonov said. An agreement between the Indian and Russian governments on cooperation in development and production of missile systems with anti-ship missiles was signed on 12 February 1998. With the first such agreement between the two countries, a promising new form of cooperation was launched; joint development of high-tech, high-performance rocket technology. “MIC “Mashinostroyenia" and the Indian Defence Research and Development Organisation (DRDO) then established a Russian-Indian joint venture BrahMos Aerospace, naming it in honour of the Brahmaputra and Moscow rivers. "The work is well organized, today it is quite successful. I should note that the Indian side has really advanced in recent years. The “Make in India” slogan has just appeared now, but if we talk about our project, this slogan started to be realized more than 15 years ago," Leonov said. The first contract between “MIC “Mashinostroyenia" and BrahMos Aerospace was signed in 1999 and joint work on building missile systems began. The “BrahMos” was first successfully launched in 2001 from a coastal launcher and confirmed its high performance characteristics. The Indian Navy began to use the "BrahMos" in 2005, deploying the "Rajput" missile destroyer. We started to supply the ground forces in 2007. Today, the Indian armed forces are equipped "BrahMos," both the ship and land-based versions. The project continues to develop. Preparations for first tests of the air version (with Su-30MKI) are underway. "India’s Ministry of Defence plans to install a "BrahMos" missile with underwater take off as part of its new submarine project. Earlier, in 2013, we had demonstrated that the missile was able to take off from under the water. The "BrahMos" missile was launched from an underwater platform in the Bay of Bengal," in its usual version, said the head of “MIC “Mashinostroyenia". He said there was no need for any new confirmation trials after a successful launch in 2013. The possibility of building a mini-version of the missile, a "mini-Brahmos," is being considered. "What kind of a missile this is, the answer is contained in the title. This missile is slightly smaller than the "Brahmos." For example, a typical "Brahmos" cannot be launched from the submarine torpedo. It is too heavy for an aircraft, even for one like the Su-30MKI. So we can place just one missile on it. Light missiles could be deployed in large numbers," Leonov said. He added that Russia and India are ready to export the "BrahMos". "An intergovernmental agreement allows delivering" BrahMos" to third countries. A list of these countries has been made. This work is underway," said Leonov.